Every year Cheryl Warwick spends a week with her daughter, Georgie, for some good old mother-daughter bonding time. This time they decided to join us on our globetrotting adventure in Japan and had one of the best times yet! Hear what Cheryl had to say about her first time as a globetrotter below. They have taken me places, both literally and figuratively, that I never thought I could go to. Being about 6 or 7 and learning to ride on an old horse that belonged to a friend of the family. It wasn’t my horse, but a pony I rode a lot as a child was called Nimbus. A portal for me that totally takes me to their world. Love and caring and discipline. I take my daughter on a week’s holiday every year – mother/daughter bonding – and thought this looked great. We both love horses, riding and Japanese food! Riding on snow covered ground to a lookout and seeing Mt. Fuji shrouded with clouds. 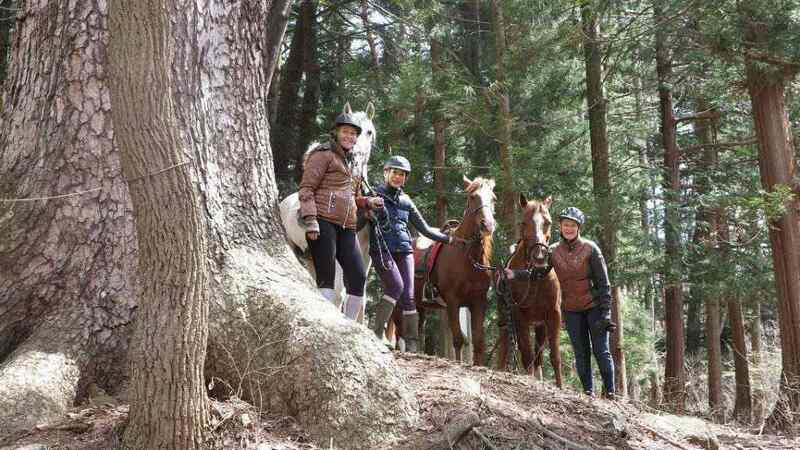 Being with people who share your passion for horses and riding and seeing the countryside from a horse’s back and at a different pace to a lot of frenetic tourist offerings. Only had the one, so far – Dasha, who looked after me and I loved. I had lost my nerve a bit and Dasha has gone some way to restoring it! Open yourself up to experience and enjoy everything and anything that comes up!